Munchkin found her way to the farm in 2014, when farm manager Jenn found Munchkin and her sibling in the biofuels area. Sadly, her sibling later passed away. After realizing that they had been abandoned by their mother, Jenn adopted Munchkin into the farm family and hand-raised her. Munchkin had a rough start to life, with her eyes glued shut and a bad kitty cold. Through Jenn’s dedicated nursing, Munchkin recovered her strength to become the happy, healthy kitty that we see on the farm today! Perhaps as a result of being hand-raised by humans, Munchkin has never learned to properly meow, but instead chirps. Certainly as a result of being hand-raised, Munchkin and Jenn are inseparable. These days, Munchkin is the friendliest of the farm cats. She can often be found sunning herself in front of the Apprentice’s yurts, rolling in the dirt, or wandering around the parking lot. 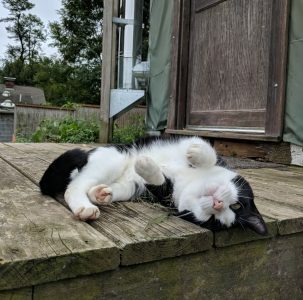 After learning to hunt from her fellow farm cat Greypuss, she has become such a prolific hunter that the resident barn swallows attack her whenever they see her. When she is not on the prowl, Munchkin likes to “babysit” small animals that she “rescues.” There seems to be a small discrepancy of understanding between Munchkin and her charges, though, as they are usually terrified for their lives after being abducted from their homes. Munchkin also likes to play with sticks and leaves, and inexplicably seeks out poison ivy. Munchkin makes no question of her desire for attention! As such, she is a big fan of our other resident attention hog (dog), Bella. 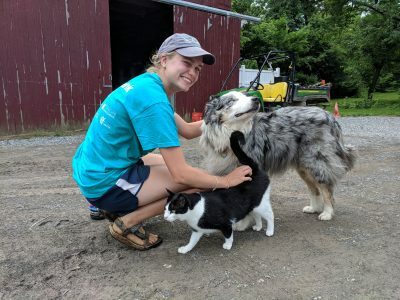 Bella and Munchkin have a friendly competition running on who can get the most attention from farm staff and visitors. So far, it appears to be a draw. 2 Responses to "Staff Spotlight: Munchkin"
Loved the content , thanks for sharing.